Cannon EOS T3i is younger and cheaper sibling of the same cannon family.It got time to burst shooting speed, with and additional articulater LCD and few other features. 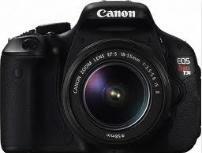 With few exceptions T3i body interface are almost identical to the T2i. Its slightly heavier but not larger.The rubberised grip feels personal confortable, when using single handed.T3i is slightly lower magnification than previous models. It moved the display button to the top and replace it with info. Camera operations are straight forward.On the back their direct access contols for frequently setting like exposure, white balance etc.You can always chnage the setting including metering , flash image quality etc.Mode dial includes the usual set of manual semi manual automatic and scene modes as the 60D however . The placement of the movie mode which is the opposite side of the dial from the advancement and unseemly frustrating things to use.